Yauch revealed he was diagnosed with cancer in his parotid gland (the largest salivary gland) in a video posted on the group’s official website in July 2009. The trio delayed the release of Hot Sauce Committee, Part One and canceled a tour so Yauch could undergo surgery and radiation treatments. In October of that year, Yauch told fans he was feeling “healthy, strong and hopeful that I’ve beaten this thing” after his surgery and a trip to India, where he saw Tibetan doctors and attended a workshop led by the Dalai Lama. Yauch updated fans via an email blast in April 2010, saying he hoped they’d join him in twice-daily meditation sessions during which he’d be “picturing smashing apart all of the cancer cells in the world.” In January 2011, he was forced to respond to reports misstating his health status, telling fans, “While I’m grateful for all the positive energy people are sending my way, reports of my being totally cancer free are exaggerated. 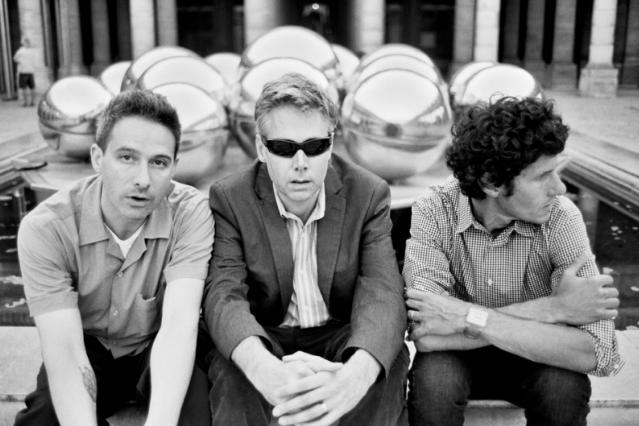 I’m continuing treatment, staying optimistic and hoping to be cancer free in the near future.” In April 2011, the band released Hot Sauce Committee Part Two and Yauch directed the group’s short film for “Fight For Your Right Revisited” as the band explored alternate ways to promote the album without doing many interviews or any performances. The group’s assumed set at the Rock Hall induction would have been their first major appearance since Yauch revealed his diagnoses nearly three years ago. The Beasties’ Rock Hall honor is an historic one, too — they are only the third hip-hop act welcomed into the Hall of Fame, following Grandmaster Flash and the Furious Five in 2007 and Run-DMC in 2009. Because Mike D and Adrock would not perform without their bandmate, Kid Rock, the Roots’ Black Thought and Travie McCoy dressed up in matching green Adidas tracksuits and turned out a Beasties medley Saturday night featuring “Sabotage,” “So What’cha Want,” and No Sleep Till Brooklyn” with the Roots serving as the backing band.